Each month I will be featuring a new vendor in the Tampa Bay area. To kick off the first vendor review I would like to feature Tampa Bay Watch. I have to admit I am a bit partial to this venue because it is where I got married almost 6 months ago. 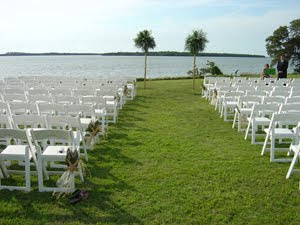 For my wedding I wanted to have a sunset theme and I wanted the reception to be on the water or overlooking the water. I searched for months and months and visited every venue on the beach or intercoastal and I still couldn't find "The One". We were looking for a venue that fit within our budget and that spoke to our personalities and I stumbled upon Tampa Bay Watch. It was like finding a needle in a haystack and I knew instantly that it was "The One". I instantly made an appointment to view the venue and by that weekend we had booked our site. Tampa Bay Watch is located on the southern tip of St. Petersburg in Tierra Verde right before Fort Desoto. 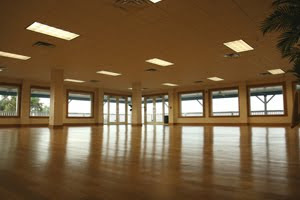 This beautiful venue has a spacious 2,500 square foot indoor and outdoor area for dining and dancing. The interior has a large open area with wall to wall picturesque windows overlooking the bay - perfect for those sunset photos. There is a deck that wraps around the back side of the venue so your guests can mingle on the porch and in the main dining hall. It promotes an open aired environment and a relaxed feel with stunning views. For those looking for a ceremony location as well, you can choose to get married on the beautifully manicured lawn overlooking the bay. 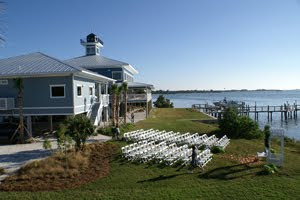 In addition to the beautiful venue and amazing views the price is very very reasonable compared to other venues on the water (they even provide the tables, chairs and linens) and the staff is just wonderful! You will work closely with Laura, their wedding coordinator, and she is awesome! She is so accommodating to what the bride wants and she will try to meet all of your requests. She will be there throughout the wedding to make sure all goes according to plan. They do have a couple of rules that all brides have to abide by but overall my experience at Tampa Bay Watch was top notch. I could go on and on about this venue, but one more thing I will tell you before I end this review is that not only is this venue beautiful, but it is also works to protect our oceans. Tampa Bay Watch strives to counteract the huge loss of wetland habitats by expanding community involvement with hands-on restoration and protection projects around the bay. They work with volunteers, students, at-risk youth and civic organizations to participate in environmental projects such as coastal cleanups, rebuilding oyster domes and bars, restoring salt marsh grass and planting sea grass just to name a few. For me, it made me feel better to know my money was not only going towards a beautiful venue for my wedding but also to a good cause. I hope this review has helped you and if you are in search of a venue, give Laura a call and visit Tampa Bay Watch.